Acad. 2: 474. 1868. Juncus canadensis subcaudatus Engelm. loc. cit. 1868. Stems 1°-4° high, erect, 2-4-leaved, few in a tuft, from a branched rootstock. Basal leaves usually decayed at flowering-time; stem leaves with large loose auriculate sheaths commonly 2'~4' long, and a stout erect blade usually 4'-10' long; panicle 3'-10' in height, the branches moderately spreading; heads top-shaped to hemispheric or subspheric, 5-40-flowered; perianth 1 1/2"-2" long, the parts narrowly lanceolate, acute, the inner longer than the outer; stamens 3, one-half to two-thirds as long as the perianth, anthers much shorter than the filaments; capsule lanceolate, acute, mucronate, 3-sided, 1-celled, reddish-brown, exceeding the perianth by 1/2" or less; seed 1/2" to nearly 1" long, tailed at either end, the body with a smooth shining coat, about 40-striate. Newfoundland to Minnesota, Georgia and Louisiana. J. canadensis brevicaudatus Engelm. Trans. St. Louis Acad. 2: 436. 1866. J. canadensis coarctatus Engelm. loc. cit. 474. 1868. J. brevicaudatus Fernald, Rhodora 6: 35. 1904. Plant 6'-2i° high, slender, tufted, the rootstocks short. Leaf-hlades less than 1" thick; inflorescence 1'-6' long, with few or several 2-7-flowered heads on ascending branches; perianth a little more than 1" long, its parts subulate-lanceolate, acute, or the inner obtusish, somewhat shorter than the outer or nearly equal; capsule dark brown, narrowly oblong, acute, longer than the perianth; tails of the seed about half as long as the body. Wet ground, Newfoundland to Minnesota, New York, West Virginia and Michigan. 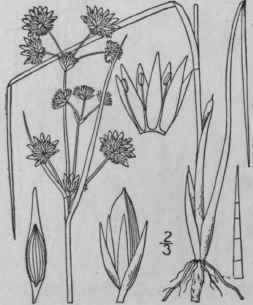 Juncus acuminatus Michx. Fl. Bor. Am. I:192. 1803. Plant 10'-3° high; rootstock short and inconspicuous. 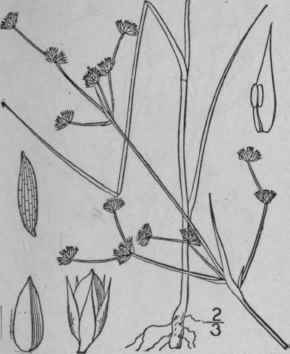 Stems few or several in a tuft, erect, 1-3-leaved; blades of the lower leaves 4's' long, 1/2"-1" thick, the upper shorter; inflorescence 2'-6' high, and with 5-50 heads, rarely larger, or reduced even to a single head, its branches usually spreading; heads top-shaped, hemispheric or subspheric, 3-20-flowered; perianth 1 1/4"-1 3/4" long, its parts lanceolate-subulate, nearly equal; stamens 3, about one-half as long as the perianth; anthers shorter than the filaments; capsule ovate-lanceolate, broadly acute, mucronate, i-celled, equalling the perianth, light brown at maturity, the valves separating through the apex; seed oblong, about i" in length, tipped at either end, reticulate in 16-20 longitudinal rows, the areolae transversely many-lined. Maine to southern Ontario and Minnesota, south to Georgia and Mexico. Also on the northwest coast. Heads often proliferous. 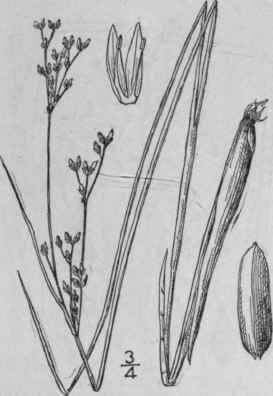 Knotty-leaved rush.